Just one month after the 2014 NGS Family History Conference began, it was time for the 2014 SCGS Jamboree. The many volunteers at the Southern California Genealogical Society work hard to host the Jamboree year after year in nearby Burbank, and the fruits of their labors are apparent. There was an excellent lineup of speakers, a jam-packed exhibition hall, and, from what I could tell, enthusiastic attendance. This was my second year attending, and I definitely stayed busy. I filled pages of notes during lectures on the records of widows and orphans and the history of American divorce by Judy Russell, The Legal Genealogist, and came away with plenty of inspiration for preserving some tricky rolled family photographs after a lecture by Denise Levenick, The Family Curator. I caught several appearances by Joshua Taylor, and whether speaking about advanced online research techniques or how to engage the next generation of genealogists, he knows how to reach his audience. In addition, I attended the annual blogger summit, which is precisely what gave me the final burst of inspiration that I needed last year in order to start blogging, once and for all. I donned the blogger beads worn by the other Geneabloggers and joined in the annual group photo, which you can see here. Of course, it wouldn’t be a conference without its fair share of socialization – and social media. I fed off the energy of Jen Baldwin, Twitter extraordinaire, to up my number of Tweets per session, and also caught up with fellow NextGen Genealogy Network board members, the aforementioned Josh and Jen, and a wonderful group of supporters at our evening meetup. Last but certainly not least, throughout the conference, I met several of my favorite bloggers face-to-face for the first time. If you’re thinking about attending next year, the SCGS Jamboree is a great way to spend a weekend! 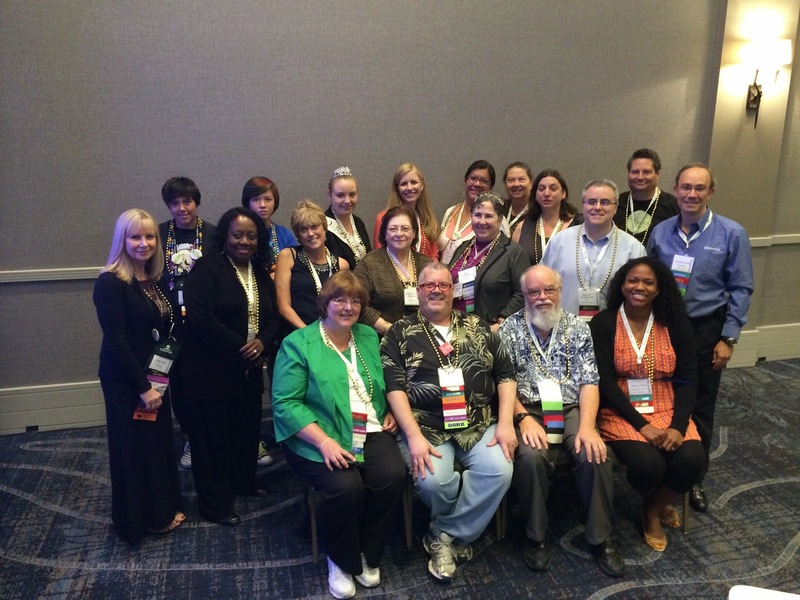 This entry was posted in Professional Development and tagged #SCGS2014, conference, Jamboree, NextGen Genealogy Network, professional development, Southern California Genealogical Society on June 9, 2014 by Melanie Frick. Melanie, it was great to meet you face-to-face! Jamboree is a wonderful event and I am glad to have been a part of it all . 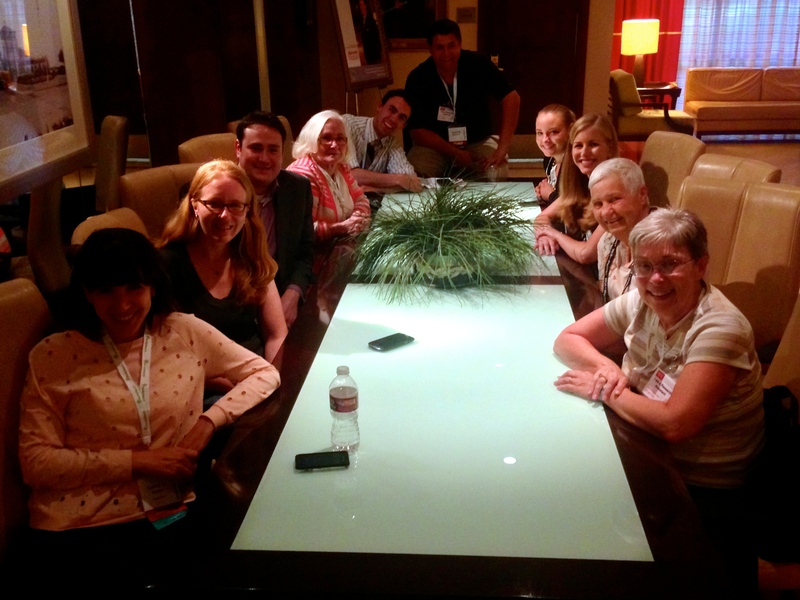 . . the best part for me too, meeting new bloggers and genealogists. So glad you made sure to come and introduce yourself . . . thank you! Thank you, Gini! It was so nice to meet you as well – I look forward to crossing paths again!